My edition: Paperback, published on 28 February 2015 by Sphere, 396 pages. Description: Summer has arrived in the Cornish town of Mount Polbearne and Polly Waterford couldn't be happier. Because Polly is in love: she's in love with the beautiful seaside town she calls home, she's in love with running the bakery on Beach Street, and she's in love with her boyfriend, Huckle. Little Beach Street Bakery was one of my favourite reads by Jenny Colgan's hand, not to mention that it gave me a renewed love and appreciation for flavoursome and fragrant home-baked bread, so it was a delight to return to Mount Polbearne in this sequel and see what bread-baking Polly, honey-making Huckle and of course adorable Neil the puffin - who turned out to be so popular with readers that he now stars in his own book and even has a Twitter account - are up to. Though this is very much the continuation of the story set up in the first book, new readers can dive straight in too as Colgan opens the novel with a brief recap that brings everyone up-to-date. While we left our lovely bunch of main characters happy and content at the end of Little Beach Street Bakery, things aren't quite as smooth-sailing as you'd expect. When we catch up with Polly et all, the new owner of the bakery is even more horrible than Mrs Manse used to be and it's only Polly's love for the craft of baking and feeding her customers quality food that keep her from resigning on the spot, though despite trying her hardest not to give up her job is in peril nonetheless. Now living with Huckle in the lighthouse on the island the two have found that the awkwardly shaped building means their rooms are spread over several levels and they have to walk a lot of stairs every day, which is starting to get frustrating. And then there's Neil. It becomes increasingly clear that the ray of sunshine from the first novel is not a suitable pet and Polly faces the heartbreaking decision whether she wants to keep him even though it's not good for his development, or whether she can let him go. 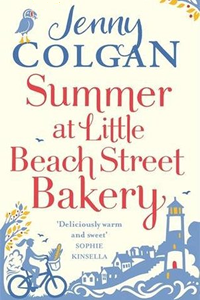 Summer at Little Beach Street Bakery sounds like a difficult and moving novel and there were definitely a lot of moments like that. Less lighthearted than the first book, which already dealt with some quite heart-rendering events, all the bad things that piled up against Polly, Huckle and Neil finding happiness really got me down at times. This was largely due to the new owner of the bakery, who was a big bully and made matters worse than they should have. Though admittedly both Polly and Huckle made some questionable choices too, which added to the darkness of a large portion of the novel. Thankfully it wasn't all doom and gloom, which was mostly because of the lovely people surrounding Polly. Selina was an especially interesting addition. Though I found her therapy sessions unnecessary filler, I enjoyed seeing her friendship with Polly grow over the course of the novel as they both were in need of a friendly face on the island. And of course Polly's best friend Kerensa, who is now married to Huckle's multi-millionaire buddy Reuben provided a lot of entertainment throughout. And a surprising amount of heart and good sense too; who would've thought it would be Reuben talking some sense into Polly, rather than the other way around?! While Summer at Little Beach Street Bakery is anything but careless sunny days for the villagers of Mount Polbearne, it was a joy to return to beautiful Cornwall and spend a little while longer in the company of Polly, Huckle, Neil and their lovely friends. I wrote this as a guest review for Laura's Little Book Blog.